Twenty-five after the genocide, Rwanda is still an enigma. Its recovery in economic, social and psychological terms is hotly debated. Almost every aspect of the past and present is still argued over. What exactly caused the genocide (which started after a plane carrying Rwanda’s president, Juvénal Habyarimana, was shot down by unknown assassins)? How many people died? Could outsiders, in particular, the UN, have halted it? More recently, has President Paul Kagame, the Tutsi rebel commander who stopped the genocide at gunpoint and has ruled ever since, genuinely sought to heal the wounds? Or does he cynically exploit the horror to legitimize his ruthlessly authoritarian and predominantly Tutsi regime? Are the Hutus, still a large majority, quietly determined to take over again one day? Could democracy ever take root in Rwanda—or is a firm grip on government the least bad option? What is undisputed is that the killing that began on April 7th 1994 was genocide. Probably three-quarters of all Tutsis in Rwanda—men, women, children, and babies—were murdered. The true number is unknown. The un guesses 800,000: mostly Tutsis, but also 30,000 or so moderate Hutus. Mr. Kagame prefers a round figure of a million. The meticulous Alison Des Forges of Human Rights Watch was able to substantiate 500,000 deaths. She was later barred from Rwanda for criticizing Mr. Kagame’s regime. Hutus with babies on their backs hacked down Tutsi women similarly encumbered. Hutu priests oversaw massacres of Tutsis in their congregations. Hutu husbands killed Tutsi wives. Hutus were told that if they failed to kill, they would themselves be killed. Though the Rwandan army often lobbed grenades into churches and schools and fired on Tutsis cowering there, most murders were carried out by civilians wielding machetes and clubs. The issue of justice still reverberates and rankles. A year after the genocide about 120,000 suspected perpetrators were put in prisons built for 45,000. Another 300,000 were eventually incarcerated in appalling conditions. Some 46,000 Rwandans, most of them génocidaires, are still behind bars. Such was the scale of the genocide that from 2002 until 2012 a huge web of community courts known as gacaca (pronounced “gatchatcha”) was set up, under trees and in village courtyards, to dispense justice in a more traditional fashion, by asking witnesses to tell their stories before amateur judges. “No one claims that Gacaca justice was perfect but very few here doubt that it saved Rwanda,” says Nick Johnson, a British law professor. With justice has come a measure of reconciliation. “No other country today has so many perpetrators of mass atrocities living in such proximity to their victims’ families,” writes Phil Clark of the School of Oriental and African Studies in London. Mr. Kagame’s great claim is that there has been no large-scale violence inside Rwanda for the past 24 years. Mr. Clark, who has conducted more than 1,000 interviews with Rwandans on both sides of the Hutu-Tutsi gap in the past 16 years, says his respondents nowadays describe “peaceful but uneasy community relations”. In part, this has been achieved through a widely understood if unspoken, a contract whereby people have traded political freedom for peace and economic development. The economy has recovered rapidly. Infant mortality has halved since 2000, a feat UNCEF rates as “one of the most significant in human history”. In 1995, when the country lay in ruins, GDP per person was $125. Today it is around $800, though some economists question Rwanda’s rosy statistics. 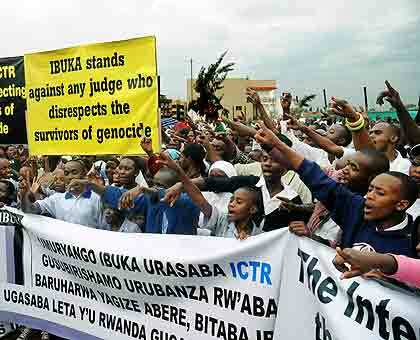 Few Rwandans have the nerve to dissent. A Rwandan journalist warns that “no one will ever tell you truly what they think.” A Western diplomat concurs. “People just won’t talk freely.” Mr. Kagame may have slightly loosened his elaborate system of spies and social controls of late, yet there is precious little space for political competition. He won 99% of the vote in 2017. A compliant Green Party was allowed seats in parliament last year, but its members recall how, in 2010, unknown killers cut off its vice-president’s head. Last year two opposition leaders who had sought to run for president were freed from prison, including Victoire Ingabire, a Hutu who had been sentenced to 15 years on trumped-up charges of inciting “divisionist” (ie, Hutu v Tutsi) rebellion. Her spokesman was murdered this month. Mr. Kagame has scaled back his military adventures abroad. Initially, these were intended to hunt down génocidaires lurking mainly in the forests of neighboring Congo, but they expanded into calamitous regional wars during which Congo’s minerals were looted and multitudes died. Recently, Mr. Kagame has fallen out badly with Uganda’s president, Yoweri Museveni, once a close ally, whom he now accuses of harboring Rwandan “traitors”. He particularly detests the Rwandan National Congress, a group of fellow Tutsis who were once his closest comrades. It has supporters across a wide diaspora, including in Belgium, South Africa, Uganda, and America. Several have been assassinated on foreign soil. Twenty-five years after taking power, Mr. Kagame faces two tests. The first is whether he will be able to hand over smoothly to a successor. The second is whether, when he does go, Rwanda’s terrible wounds will reopen. Mr. Kagame’s boosters argue that only he has the authority to hold together so fragile a country. That argument loses force with each passing year. Under a fifth of the population is old enough to have been adults during the genocide. Most children have grown up with the idea of “Rwandaness”, inculcated into them in education camps, known as ingando, that try to minimize ethnic differences. More will begin to demand freedoms enjoyed elsewhere. Without the safety valve of democracy, protests and anger could again take on an ethnic tinge, awakening the demons that Mr. Kagame claims to have banished. Source: First appeared in The Economist today 3/28/2019.